NEW enhanced volume for BalckBerry Bold. NB. If the sound volume is too quiet for your BlackBerry, choose a different sound or set Audio Boost. 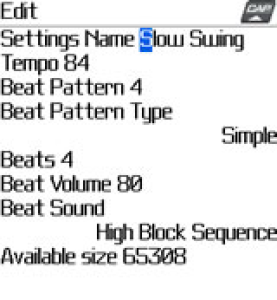 New style Version 2 with quick change main screen controls, favourites and customized complex beat patterns. Provides a convenient alternative to conventional metronomes, always available wherever you and your BlackBerry are. Assists musicians in keeping a regular tempo while playing or rehearsing. Provides metronome beats at various tempo settings up to 840 beats per minute and alternative Visual beat display. An optional beginning of bar bell sound can be set for the appropriate number of beats in a bar. Thieves Solitaire is an addictive solitaire cards Game – simple to play, tricky to master.